Aughnagarron school’s project on Eddie Macken won first place in the ‘Sé mo Laoch’ competition in conjunction with The Education Centre, Carrick on Shannon. School pupils in Ireland are behind a call for a statue to be erected in honour of local showjumping hero Eddie Macken. Aughnagarron national school pupils, including Eddie’s grandniece Aoibhinn Macken, recently completed a project on Macken for the ‘Sé mo Laoch’ competition, which they won. The contest promotes local history and local people who have made a mark nationally or internationally. The project from the 27 pupils included articles, poems, and pictures. The youngsters, along with their Irene Brad,y are lobbying to have a statue erected in Longford dedicated to the showjumper, the Longford Leader reported. “He was the Brian O’Driscoll of the 1970s and 80s and we’re delighted that we celebrated his life in a small way,” Brady told the newspaper. The career of Macken, who now lives in Canada, spanned four decades and hundreds of world class championships. His most well-known horse was Boomerang, and between 1975 and 1979 they blazed an incredible trail, winning or finishing second in a record-breaking 32 major Grand Prix and Derby events across Europe and America. Boomerang and Eddie Macken in 1978. Macken topped the World Rankings for three successive years between 1976 and 1978 amassing colossal prize-money. 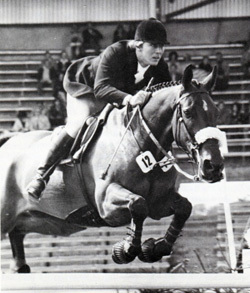 Macken also claimed four consecutive Hickstead Derby wins (1976 to 79), with the derby trophy renamed the “Boomerang Trophy” in honour of his famous horse. The school is looking to send a copy of the project to Macken.